Our star Hannah has been adopted! 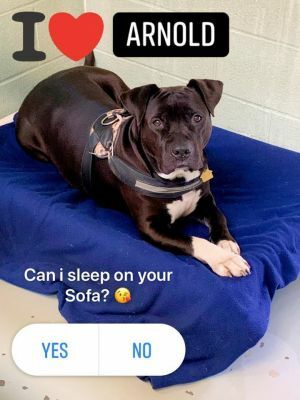 02/26/19 Update: Hannah has been adopted! Hip Hip Hooray! Here is a pic of our girl Hannah Banana comfy, cozy and quite simply content in her furrever home! Great news! Adoptable dog Hannah recently appeared on Good Day PA on ABC 27! Click here to see our super star Hannah in her TV debut! Great job girl! You rocked it! We are oh so hoping this feature will help Miss Hannah connect with her one and only furrever family! She soo deserves to be loved and cherished! A little introduction to our volunteer favorite, Hannah! Hannah is our super star! She recently appeared on Good Day PA, a morning show on local tv station, ABC 27. She loved riding in the car to the tv studio. She also enjoyed meeting the package delivery man and the mail lady outside the tv studio in Harrisburg! Affectionately called Hannah Banana this gal enjoys going for walks and exploring outside! A simple 30 minute walk in the morning and a 30 minute walk in the evening sound great to her! Hannah is treat motivated and looves back scratches and belly rubs. Hannah likes to be near her humans, but not necessarily on her humans. She is very loyal and sweet once she gets to know you. Hannah was previously adopted from our shelter but sadly had to be returned when her owners moved and could not take her with them. Hannah does AOK with human kiddos but would need to be the only canine in your family! Hannah is a three year old spayed female mixed breed! In the Spring of 2019 Hannah will be here at our shelter for one year! Please consider opening your heart and home to this lovely girl! She oh so deserves to be loved and cherished by her very own family! Previous PostRescue Me Dance! January 26!Next PostWoofs and purrs! Rescue Me Dance!